It was at this point that the day started to nosedive. While moving the aircraft from hangar storage back to the GA parking area, my instructor decided to allow me to have a go at taxiing. It did not go well. I over-compensated with my rudder pedal movements and couldn’t manage to use the toe brakes equally to bring the aircraft to a straight line stop. “Oh well,” thought I “practice makes perfect. Plenty of time for this in another lesson.” But I remained annoyed at my incompetance anyway. Next up was the first external pre-flight inspection of the day for the aircraft – the ‘walkaround’ or ‘A’ check. This was completed without issue and the paperwork logged. All that was necessary now was to wait until a persistent bank of low cloud cleared at the end of runway 22. However, by about 10.30, it still refused to move and the decision was taken to taxi out and takeoff from runway 35 instead. Internal pre-flight and power checks were completed normally and we took up our position on the threshold of 35. There was a significant crosswind component, so our takeoff and climb was a little bumpy, but that’s all part and parcel of light aircraft flying and doesn’t phase me. 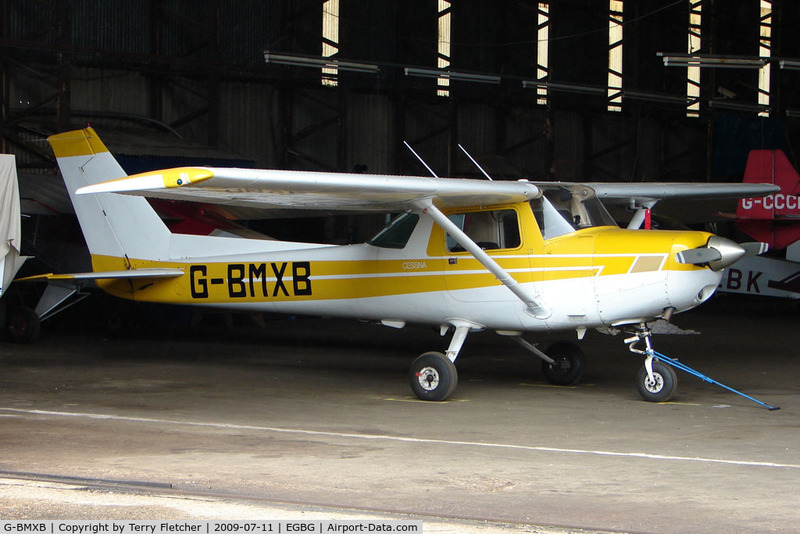 G-BMXB is cheery looking yellow and white Cessna 152 and a recent addition to DSFT’s fleet. This was my first encounter with her and the cockpit layout is a little different to G-OFRY. It’s worth mentioning that she has also recently been fitted with a new engine. The new engine fitting is relevant because as we reached approximately 2000ft into our climb, the instructor looked at the engine temperature gauge, saw that it was redlining and informed me that he didn’t like it and that we would immediately be returning to the aerodrome. What followed was an unexpected and impromptu lesson in emergency procedures as the aircraft was nursed back towards runway 22 and then reduced to idle throttle, resulting in a controlled glide landing. Everything was done by the book and I had complete confidence in my instructor – I was even somewhat surprised by my own calmness and presence of mind when asked to dial in the QFE (local air pressure) setting given in response to our radio call. Needless to say the incident threw me somewhat (and raised my blood pressure I’ve no doubt!) and I had no time to consider the possibilities before we were strapped into G-OFRY and heading skyward again. The ‘fight or flight’ state of adrenaline release I was now in obviously affected my ability to concentrate on the lesson and trying to keep the aircraft flying straight and level, in balance, with various power settings, flaps etc. – amidst increasing air turbulence – was just all too much. Absorbing so much data at the same time as trying to coordinate several functions together was just mentally draining. Once on terra firma, I just walked away from the aircraft, internally cursing my own failure to master the basic principles and wondering whether continuing with my training was actually worth it. Just two lessons in, and I was seriously considering quitting. The joy of flying had evaporated and I went home despondent. Negative thoughts plagued me for a good few days afterward as I considered carefully how I felt and what had happened. I decided to message a good friend of mine who is a pilot and just run the events past him for his thoughts as I knew he would understand both the technical and emotional aspects of flight training. I received two wonderfully supportive and encouraging replies over the course of the weekend and he assured me that the thoughts, feelings and frustrations I was feeling were normal and typical for student pilots. Those comments contributed greatly to me re-aligning my thinking about my further training and to stick with it. One week on and I’ve been back up, in G-BMXB, and enjoyed a much more positive experience. That will be the subject of my next post. Take Home Thought : – I now fully understand why part of the training syllabus covers ‘Human Performance and Limitations’.